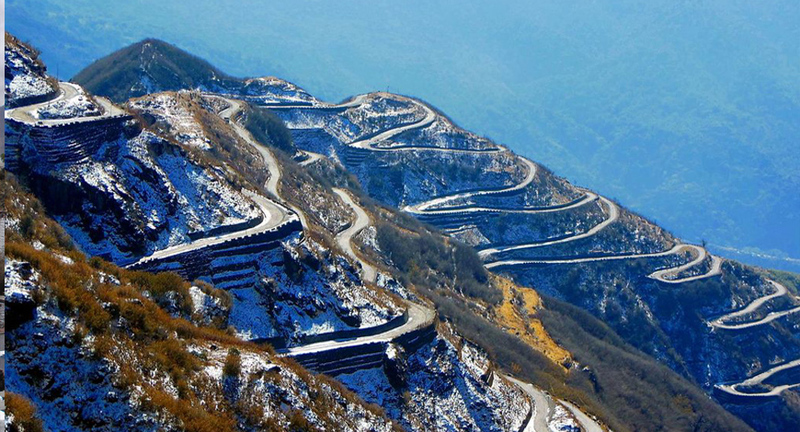 Sikkim a majestic Himalayan state has its own identity as a piece of paradise for outdoors lovers. The land of Sikkim is combination of great mountains, high hills, varied culture and different religion. This state is home of three major population groups Lepcha, Bhutiya and Nepali. It's an amazing place of hidden valleys, mystical monasteries, snow fed ice-lakes and wide range of flora and fauna. Sikkim is situated among other mountain countries and hill districts: Tibet(China) in the north and east, Bhutan and Darjeeling in the south-est and Nepal in the west. Mt. Kanchanjangha (8586mtr) dominats the landscape and is regarded as country's guardian deity. Tamang Expeditions offers and organizes trips in Sikkim collaborating with some of the travel agents under provisions of Indian-Sikkim government. We have been arranging following trips on regular basis. Day 01: Flight from Kathmandu to Bhadrapur near Border. Pick up and drive to Gantok (capital city of Sikkim) Overnight(O/N) at Tibet Hotel. Day 02: Full day sightseeing of Gantok. Visit Institute of Tibetology, Do-Drul Chorten,Govt. Institute of Cottage Industry, and Enchey monastery. O/N at Tibet Hotel. Day 03: Transfer to Kalimpong(altitude 1243 mtr) which is 3/4 hours drive; visit Durpin monastery, flower nurseries, Dello view point. O/N at Orchid Retreat. Day 04: Transfer to Darjeeling (2123mtr) which is 3 hr's drive. Visit Tibetan Refugees Self Help Center, Himalayan mountaineering Institute, museum, Botanical Garden. O/N at Deelkling resort. Day 05: Early morning drive to Tibet Hill (2573mtr) for sunrise with view of Mt. Kanchenjungha, Mt. Everest and other famous peaks. Visit Ghjoom monastery and drive 3 hrs to Siliguri towards Nepal Border. O/N at Hotel Cindrella. Day 06: Transfer to Bhadrapur and late afternoon fly to Kathmandu. Arrival in Kathmandu. Day 01: Pick up from Bhadrapur airport and transfer to Gangtok (1547mtr) O/N at hotel Tibet. Day 02: Gangtok full day sightseeing. Visit Rumtek monaster 24 KM from Gangtok. On the way back visit institute of Tibetology, Do-Drul Chorten and after lunch visit Government Institute of Cottage Industry and Enchey Monastery. O/N at Tibet Hotel. Day 03: Transfer to Yuksam (1780m) 133 Km via Temi Tea Estate, Yuksam means the meeting place of three superior ones of the Tibetan religion. They came from Tibet to establish a Buddhist monastery and the first king Chogyal was consecrated in 1641 AD by the 3 Dharma kings. Yuksam was chosen as first capital of Sikkim. O/N at Tashi Gang. Day 04: Trek start! gradually through sup bropical and temperate forest, lunch en route, then climb gradually up to Perk Chu bridge about 4 hrs. then steep climb to Tshoka (3005 mtr) 2 hrs a pictrusque herders village with first view of Mt. Pandim and the last village iin this route. O/NO at camp. Day 05: Cimb through Rhododrendon and fir forest 3 hrs to Phedang. Lunch enroute continue on for 2 hrs to Dzongri (4030 mtr). O/N at camp. Day 06: Descend into Perk Chu valley, lunch enroute to Thansing (3930 mtr) well situated in a glacial valley directly beneath Mt. Pandim 8 km 4/5 hrs walk and camp. Day 07: Trek to Samiti Lake (4250 mtr) a blue glacial lake 4 KM or 3/4 hour walk. O/N at camp. Day 08: Start walking before sunrise and climb 4 hrs along glacial moranine to Goechela pass for spectacular view of Mt. Kanchenjungha, surrounding peaks and glacier walk back to Thansing. O/N at camp. Day 09: Take an alternate route to Phedang which is 4/5 hour's walk a marvelous trail through Rhododrendon, firs forest. Lunch at Phedang then short walk down to Tshoka. O/N at camp. Day 10: Trek back to Yuksam which is 5 hr's. O/N at camp. Day 11: Transfer to Kalimpong (1243mtr) by tourist bus. Visit Drupin monastery, Dello view point. O/N Orchit Retreat.